Isaiah Newsome of Des Moines on another visit in December 2014 to Blank Children's Hospital for treatment of sickle cell anemia. Newsome, who has had the disease since birth, usually has made two visits monthly to the hospital but awaits bone marrow transplant in early 2015. The national focus has been on health care reform, but studies show that here in Iowa, African Americans and Latinos are more likely to need medical care, but less likely than Asian or white Iowans to actually receive it. 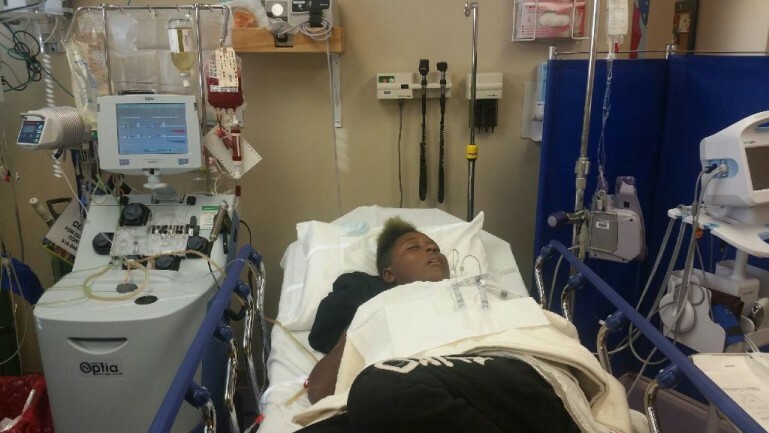 For one Des Moines teenager, time spent playing sports and hanging out with friends is cut short when his body, stricken with sickle cell anemia since birth, becomes wracked with pain and requires hospitalization. “When I get sick it hurts. Sometimes my arms will hurt, sometimes my back will hurt. The pain just progresses so much that we can’t handle it at home anymore, we have to take it a step further and go to the hospital,” 17-year-old Isaiah Newsome said. Getting adequate health care has not been easy but at least he has had insurance, even though his mother had been without insurance for some time until the past year. Other African American families in Iowa with low incomes do not have insurance, adding to difficulties they face getting health care. African Americans are just 3.3 percent of Iowa’s population, but they make up 26 percent of the state’s prison population. What’s behind criminal sentencing discrepancies, and what might be done about it?